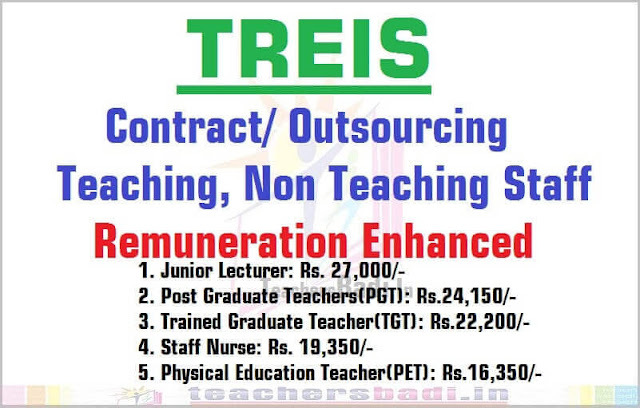 Telangana Contract/ Outsourcing Staff Remuneration: #TREIS Contract Junior Lecturers, Post Graduate Teachers(PGT), Trained Graduate Teachers(TGT), Staff Nurse, Physical Education Teachers(PET) remuneration enhanced, TS Residential Education Institutions JLs, PGTs, TGTs, PETs, Staff Nurse Remuneration enhanced, TSRS Institutions Teaching,Non teaching Staff Salaries enhanced, Contract/ Outsourcing Staff remuneration enhanced. TS Residential Schools Teachers remuneration details given below. GO.MS.No. 27 Dated: 06/07/2016: Govt of Telangana, School Education Department - Implementation of enhanced remuneration to the personnel working on Contract/ Outsourcing basis in Telangana Residential Educational Institutions Society - Orders - Issued. 1) G.O.Ms.No.99, School Education (SE-Genl.II) Dept., dt.16.07.2011. 2) G.O.Ms.No.14, Finance (HRM-I) Department, dt.19.02.2016. 3) From the Secretary, TREI Society, Hyderabad, RC.No.4680/A1- 2/A1-1/2009, dated 23.4.2016. 3. The Secretary, Telangana Residential Educational Institutions Society, Hyderabad shall take necessary action accordingly. 4. This Order issues with the concurrence of Finance (HRM-II) Department, vide their U.O.No.7844/279/A2/HRM-II/2016, dated.20.06.2016. PROCEEDINGS OF THE SECRETARY:: T.R.E.I.SOCIE (REGD): HYDERABAD. Rc.No.4680/A1 -1/2009 Dt.16 -08-2016 Sub:- Estt., TREI Society (Regd), Hyderabad - Enhancement of remuneration to the different categories of Contract Outsourcing staff in T.S.Residential Educational institutions Society - Orders -Issued-Regarding. These revised rates shall come into effect only from the commencement of the Academic year 2016-17 (i.e. after re-opening of the institutions after summer vacation) to the staff engaged on Contract/Outsourcing basis subject to the condition that they have to fulfil the following norms. 2. Outsourcing Staff:- The staff engaged in Minority Residential Schools on outsourcing basis whose certificates and performance for the year 2016-17 are verified and found satisfactory by the Observers appointed by this office Proc.Rc.No.4680/A1-1/2016, dt.8.8.2016. Any deviation in this regard will be viewed seriously and the Principals are personally held responsible for such deviation and necessary action will be initiated against them as per the rules of the Society. All the Principals of TRE Institutions in State are hereby requested to take necessary action in claiming the remuneration to the Contract Outsourcing staff, as per enhanced remuneration. A copy of the Government order vide reference cited is herewith communicated. Receipt of the proceedings should be acknowledged.